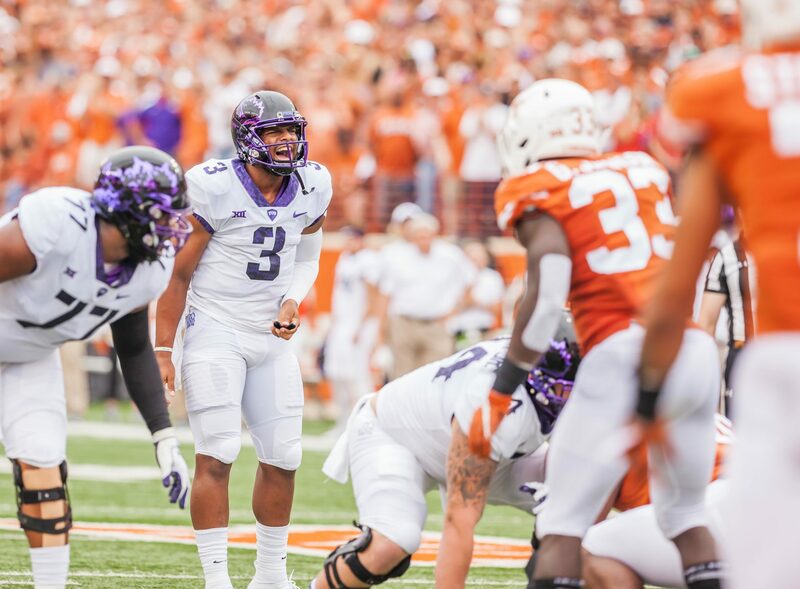 TCU quarterback Shawn Robinson calls out a play at the line of scrimmage against Texas in Austin. Photo by Cristian ArguetaSoto. TCU football’s nationally televised matchup Thursday night against Texas Tech is giving the administration headaches in two primary areas–parking and education. Parking on campus is already a hot topic (see here or here), and game day protocols mean commuter students and faculty will have to be bused in from remote lots. Pair that with concern over students skipping class in anticipation of the contest, and you can see why administrators might not love the idea. Trevone Boykin finished with 388 yards in TCU’s 40-10 Thursday night win over West Virginia in 2015. Photo by TCU 360. Due to the Big 12 Conference’s television contract with ESPN, member universities are required to host occasional Thursday night games. The last time that happened at TCU was in 2015 when the Horned Frogs defeated West Virginia, 40-10. Donovan said parking is the university’s biggest concern. Supporters pay for parking spots on game days, meaning students have to move their cars Wednesday night by 10 p.m..
It’s even tougher for commuter students and faculty, who will have to find somewhere to park off campus or figure out another way to get there. One option is to use Uber. Use the code ‘BEATTECH’ to get a $10 discount Thursday. Remote parking is available at the new Dickies Arena. Breakfast will be provided by TCU Student Affairs from 7 to 9 a.m. The bus shuttle service will run continuously from 4 a.m. to midnight Thursday. Administrators aren’t the only ones with concerns. Victor Norris, a senior history major, said he is worried about what a Thursday game will mean for students. Students study in the library. Photo by TCU 360. Senior graphic design major Christopher Brown agreed that some students will skip class Thursday, but he also stressed the academic downside. Donovan understands these concerns, but he said the decision to hold class Thursday was easy because students need to attend their lectures. Greer Baiano contributed to this report.